Crosby and I have now settled into life together in the caravan. I find it odd how differently my dogs behave when together or apart. Crosby is a lot more relaxed without Dexter, being the younger dog he is always striving to get somewhere first or grab the spot favoured by Dexter, on his own he is calmer. His chilled attitude maybe attributable to being worn out from all the extra miles we cover when just the two of us, or it might be that he has my undivided attention. Either way he is cracking company. Being on my own with him means he has to listen to me planning our walk. 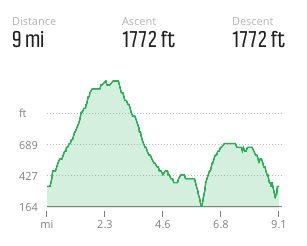 When I do this with Lynnie, I am subjected to a range of questions, including “How far?” “How long will that take?” “How steep is that hill?” “Is there an ice cream stop?” and “Are you sure you’ve calculated that right? It looks much further to me.” Whereas Crosby’s only concern is do I have enough biscuits in my rucksack to sustain him. 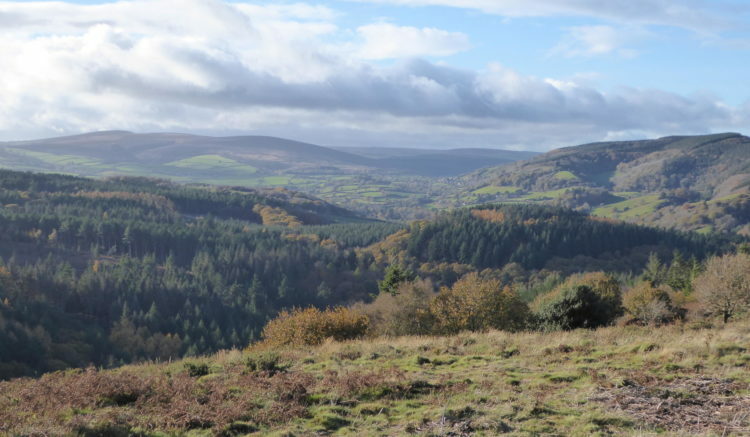 Today’s walk starts from the car park at the delightfully named Nutcombe Bottom, just south of Dunster, which is itself a delightful place. 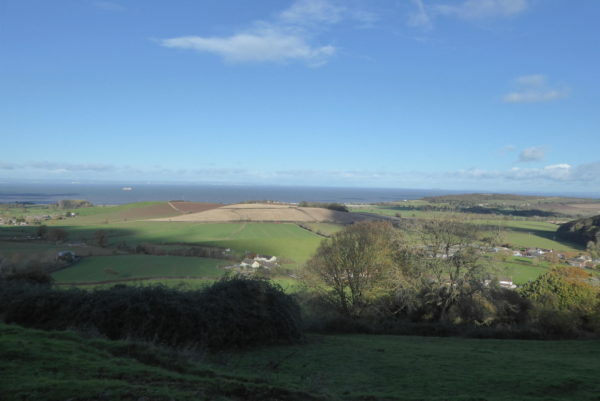 On most of the occasions I have visited Dunster it has been extremely busy with tourists. Good for the local economy, but I prefer quieter spots. Leaving the car park and walking south through Hats Wood it is decidedly chilly, I suppose I should not complain as it is mid November. However, I am a bit concerned I may have under-clubbed the clothing as I am heading for more exposed parts. 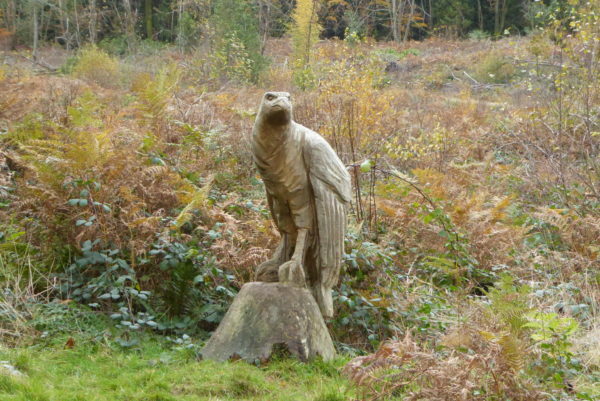 As I walk along the track I encounter a stunning wood carving of a bird of prey. Then shortly after another of a caterpillar. 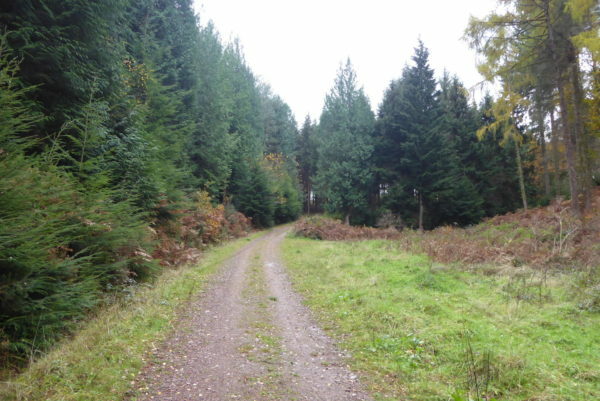 This woodland is a myriad of tracks. I always find this the most difficult environment to navigate but I keep heading south consulting my paper map and also using my OS map app to check my location. Soon we are heading through Broadwood Plantation and then the rain that has been threatening starts to fall. It is full waterproof gear by the time I am heading up Croydon Hill. I can’t start to describe the route because the network of paths makes it too complicated. However, at a junction of tracks I turn south east to head to a point where six paths meet on the edge of Withycombe Common. 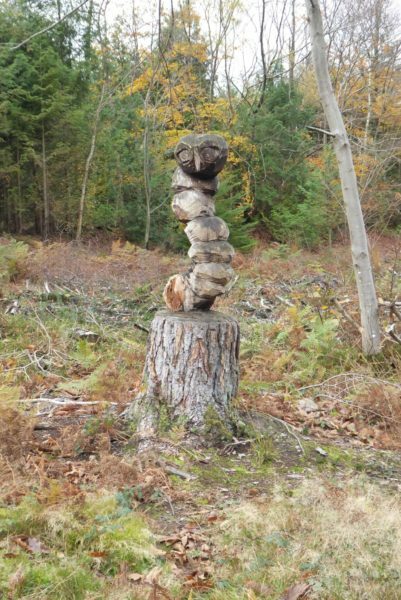 I have not seen a soul since leaving Nutcombe Bottom and being a man of a certain age feel the need to find a suitable tree to relieve my bladder. Experience has taught me whilst out walking it is better to answer a “call of nature” when in the trees rather than out in more exposed areas. I am not as choosey as Dexter about finding a suitable spot, but usually I have Lynnie as look out, today knowing I haven’t seen anyone I pop behind a tree. Years ago I recall reading Alan Bennett recounting his concerns in this department and now, Bennett like, as I return to the path I see a rambling group approaching rapidly. Do I loiter and wait for them to catch up or press ahead and pretend I have not seen them. 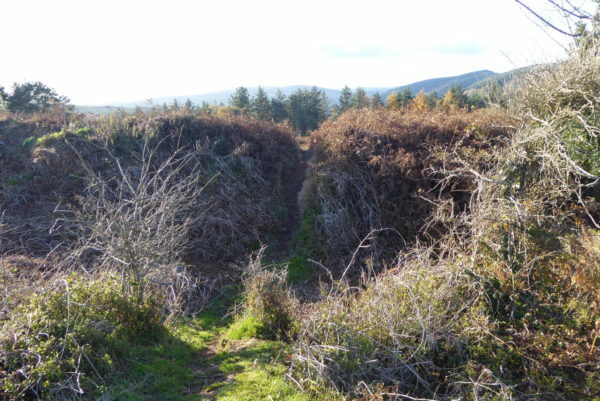 I opt for the later and at a multiple crossing of paths take one of the routes on the left heading onto Withycombe Common. Out of the trees and approaching the summit a cold wind blows. 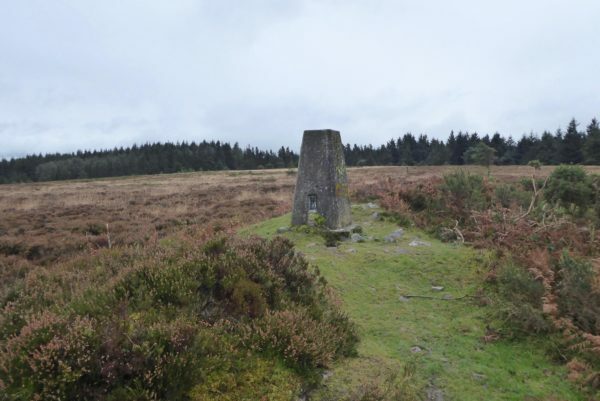 I soon reach the trig point on top of the common; successfully bagging my forty-first. There are fine views from up here across the Bristol Channel to South Wales, but it is far too chilly to hang around in the biting wind. 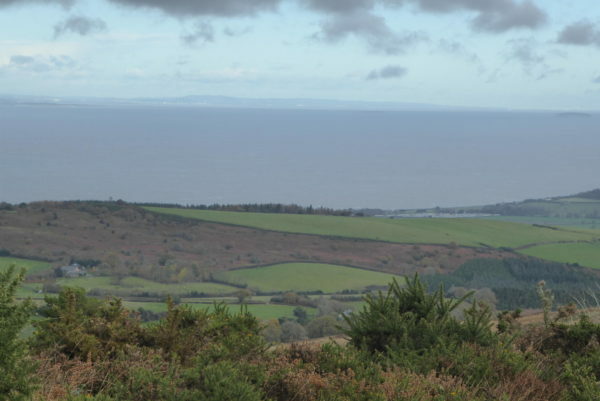 So I continue eastwards soon reaching Rodhuish Common where I continue straight on to join a track at the corner of the common. At the end of the track I turn right onto a lane and walk to Rodhuish Cross then keep on the lane as it turns to Rodhuish. 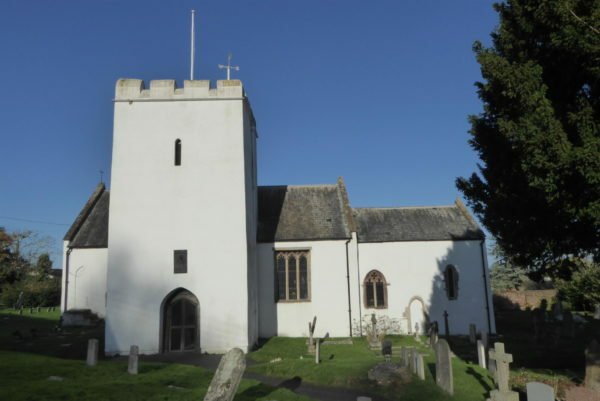 At the next fork in the road I go left soon reaching the delightful small 15th century church of St Bartholomew. The door is open so I venture inside. This is not an elaborate church, and much of the interior is said to have come from other local churches when the church was restored. 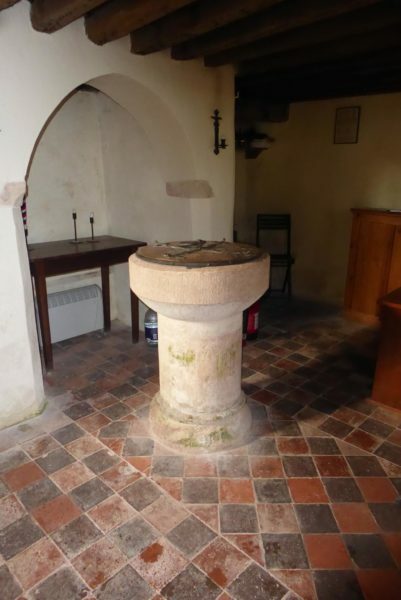 The solid Norman font was moved from Carhampton Church in the 19th century. Back outside, the bench by the church porch is in a sheltered spot out of the prevailing wind, the sun is shining and it makes a cracking spot to sit and eat lunch whilst listening to the blackbirds singing. Refreshed I continue south along the road and follow it as it bends around Style’s Farm. There is a sign advertising their ice cream, it is not one I have come across but will be sure to mention it to Lynnie so she can sample some on our next visit to the area. At the next junction I take the lane on the left (Sandrocks Lane) to head north. 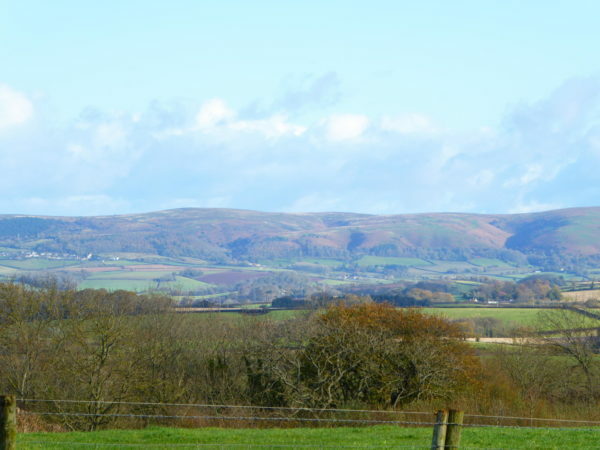 Heading uphill there are cracking views of the Quantock Hills on my right. 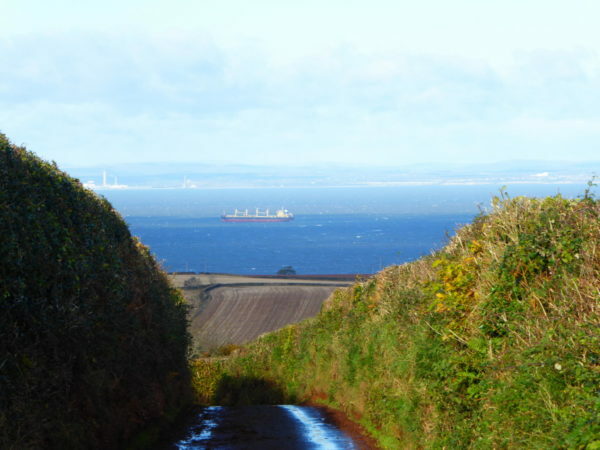 Then the view straight ahead is the Bristol Channel and South Wales. At the next junction I turn left and continue downhill into Withycombe. 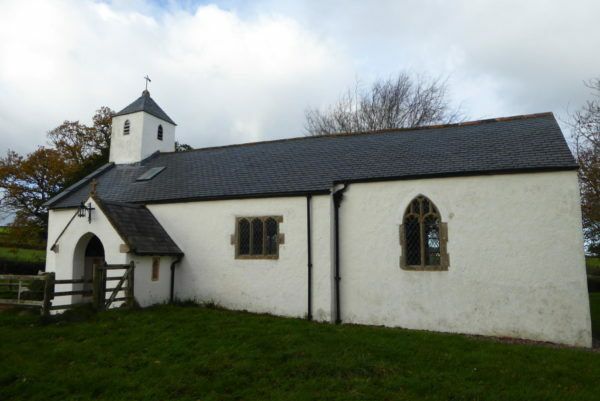 Here I turn right walking through the village and at the church of St Nicholas fork left. 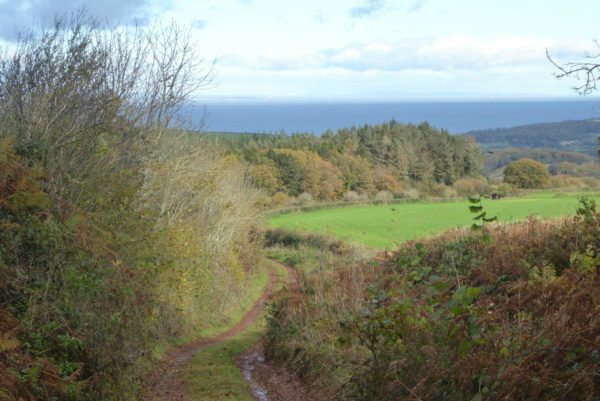 After a couple of hundred yards I turn left picking up the footpath signposted to Dunster via Withycombe Hill. I am now on the Macmillan Way West; this route takes me uphill whilst enjoying some stunning views. 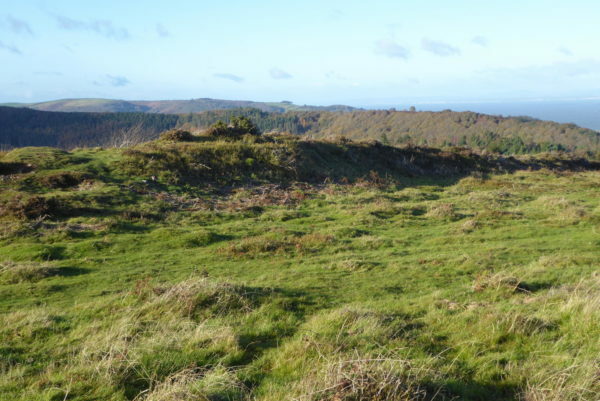 At the top of the Withycombe Hill I continue on the Macmillan Way to reach the Iron Age hillfort of Bats Castle. This is an exposed spot; ideal for seeing who is approaching, but a challenging place to build a community. A bit further on the Macmillan Way turns to the right, but I continue straight on. 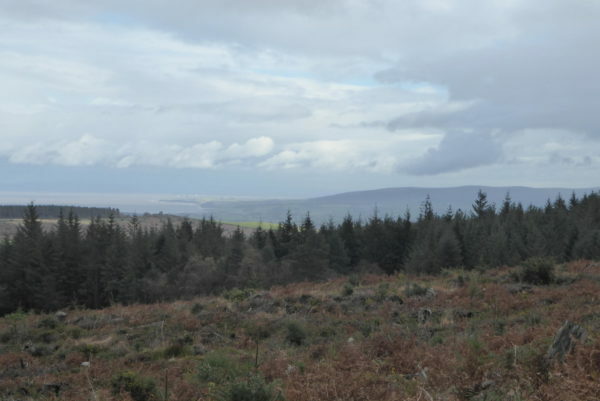 Further on is the Iron Age settlement of Gallax Hill. This is more overgrown than Bat’s Castle, but still pretty impressive. 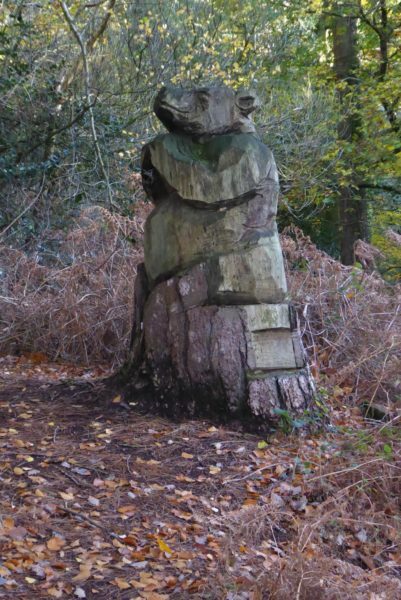 Entering woodland I descend along the path, soon encountering another woodcarving, this time of a bear. There are some tall trees in this woodland and I am tempted to take a slight detour to follow the “Tall Tree trail” at a track known as Broadwood Road. However, being a Sunday afternoon this appears to be a popular spot, so I decide to save this for another day when Lynnie is walking with me. 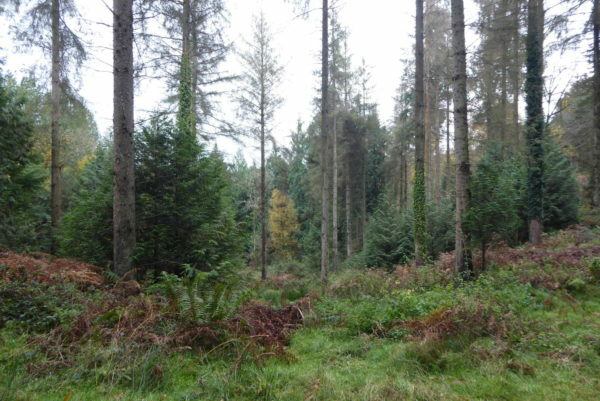 Apparently the tallest tree in England is in these woods. Arriving back at the car at Nutcombe Bottom I have covered just over nine and a half miles. Another day where apart from the few hundred yards around the car park at Nutcombe Bottom I have not seen anyone to speak to.